We’d love your help. Let us know what’s wrong with this preview of Threading My Prayer Rug by Sabeeha Rehman. To ask other readers questions about Threading My Prayer Rug, please sign up. This was a moving and wonderful story of one woman's journey through worlds both physical and spiritual. In 1971 19 year old Sabeeha "Bia" Rehman marries her husband Khalid though an arranged marriage and moves from her native Pakistan to Queens, NY where Khalid is finishing his residency. Though they believe they'll only be in America for two years circumstances soon determine that the USA is now going to be the land she calls home. A stranger in a strange land indeed. Separated from her huge an This was a moving and wonderful story of one woman's journey through worlds both physical and spiritual. A stranger in a strange land indeed. Separated from her huge and loving family and the community a nationally shared faith provided she was confronted now with the quizzical and sometimes downright hostile comments and stares of people who only new Muslim's as the bad guys in action films and associated the word Islam with acts of oppression, violence, and terror. Another woman might have sat quivering in the corner of the one bedroom apartment, crying on the phone to her parents until they sent a plane ticket home. But, Bia was not one of those women. If there was no Muslim community waiting for her in the United States she would create one. When her young family moves to Staten Island and there is no mosque for worship she and Khalid campaign tirelessly until they have the funds to build one. When the stance of the mosque becomes too conservative for her more liberal mind she and Khalid and their friends open their own religious school for their children. I would not want to tangle with Bia. As she describes her struggles, reconciling the distorted credo of Islamic extremist terrorist with her own beliefs, a fierce yearning for women to have an equal standing with men in the church, and her anger when those who share her beliefs are immediately labeled "terrorist" no matter where they are from you can tell this is a woman of passion who would not hesitate to let you know when you're wrong. This is a life changer of a book. Bia opened my eyes to a world and way of life that I was living in complete, blissful ignorance of. I'm ashamed, having read her story, of how easily we are all led into a certain way of seeing someone simply based on a sound byte or a desire to cast blame in the face of violence. She showed me a religion, a way of life, born of love and respect and humility so appealing I'd be lying if I said I didn't find myself thinking more than once "this is something I could believe in." What's especially lovely about this memoir is the way you travel with Bia through her everyday life and her spiritual one. Her faith is a fluid thing that is influenced and strengthened by time and experience and she embraces that. She realizes gradually that if you cannot change the way the world sees you then it is enough to change how your neighbors see you. She moves with the times but does not let them erode what she believes in her heart. At the same time she lets that belief grow and change and become something new when it has to. Bia has a wonderful, laughter filled voice as a writer. Yes, her witty remarks are a bit like your mom telling you a "hilarious joke" that you laugh at because she's your mom and you love her but she speaks with such a charming sincerity it is almost impossible not to utterly adore her from page one. Her descriptions of her early life in Pakistan are rich with detail and her new life in America is infused with an almost frantic energy in every sentence. You can see that she doesn't feel what she is doing in writing this book is extraordinary. Bia wrote this book because she wants to give her story and her faith to you. She wants to welcome you to a childhood filled with elaborate, boisterous parties and a loving home filled with exotic food and adoring parents and sisters, cousins, aunts, uncles and more cousins! She wants you to meet her beautiful sons who she moved heaven and earth to raise to be good men, devout men, and American men. She wants you to fall in love with Khalid the way she did, on their wedding day, when she had barely spoken a word to him and only knew she liked him for his easy manner and the smile in his eyes. She wants you to experience the beauty of the Quran and to understand how a few crazed militants who have butchered its true meaning do not speak for all or even most Muslims. She even wants you to know about the times she failed. The times she spoke too harshly and too quickly, when she was humbled, when her own children knew more than she did. She wants you to do what she did then, get right back up and learn to do it better next time and to make sure there was a next time. This is a woman who has survived wars, terrorist attacks, racism, and family tragedy and still stands as a beacon of hope that acceptance and love will always win out over hatred and fear. For her America became the only place she would ever be able to be the kind of Muslim she wanted to be. She is a true American success story. A woman who never saw insurmountable obstacles or even danger, only opportunity. Opportunity for dialogue and community and education. I thoroughly enjoyed the time I spent with Bia along these pages. A beautiful introduction to the Islam religion and its practice through the experiences of a Pakistani immigrant trying to build a religious and cultural life for her children in America. Although I knew a little about the religion and its practice before, I was surprised at how much I did not know as I read this book. It was nice to learn alongside the author as she transitions from being fairly secular to much more devout. I was just reading an article last week about how one of the most effective tools for fostering peace, understanding, and empathy for those different than ourselves is through the medium of storytelling. As someone who has been a life-long voracious reader, I couldn’t agree more. I’ve learned so much about other people, their cultures, and traditions through reading. Especially when it comes to non-fiction, I often have a tendency to gravitate toward books that are about people or things that are outside my own wheelhouse, because I have an unquenchable thirst for knowledge about things I don’t know much about. I’ve had a few books written by Muslim women on my TBR list for a while now, but I hadn’t gotten around to reading any yet. Then a member of a local Islamic group that shares our church’s fellowship hall to break their daily fasts during Ramadan came to a service one Sunday morning and briefly spoke. Until then, I had no idea that our Christian Bible and the Qur’an share some of the same “characters” and stories. Finding this out piqued my curiosity even further, so when Threading My Prayer Rug was one of the suggested reads for this month’s church book club, I eagerly voted for it. Others in our group were obviously as curious as I was, since it became our latest read. I’m glad it was, because it ended up being a very well-written book that taught me a great deal about the Muslim faith and Pakistani culture that I would highly recommend to anyone who might want to learn about either. I have to say that I thoroughly enjoyed the book. Sabeeha Rehman has a very engaging and conversational writing style that’s easy to read and made me feel like I was sitting down to have tea with her while she regaled me with her life story. Born and raised in Pakistan, she entered into an arranged marriage with a doctor who was performing his residency at a hospital in New York, which of course, meant that she had to uproot her life and move halfway around the world within a month of getting engaged and a mere day or two of officially getting married. The first few chapters of the book cover the engagement and marriage, which was quite fascinating. I previously knew only a little about arranged marriages. With our western sensibilities, I think many Americans would find this practice, at best weird, and at worst atrocious. But at least in the author’s experience it was neither, so seeing it through her eyes helped to make me see it in a whole new light. For her, this was simply an accepted and normal part of her culture. At each step of the process, she had to give her consent, so it wasn’t like she was forced into it either. While it isn’t necessarily something that I would have wanted to go through, it wasn’t nearly the oddity I was expecting. In fact, there was a certain charm and romanticism to it all that I hadn’t expected. As it turns out, the author made a soul mate match that is still going strong forty-five years later. Fast-forwarding a bit, I also liked that the author and her husband, recognizing that their sons had been raised in the US with a different culture, didn’t insist on arranged marriages for them as well. She did engage in a bit of matchmaking to help her oldest son, while her youngest ended up completely doing things his own way, but in both cases, they seemed to have also made excellent matches. Beyond the issue of arranged marriage, I really enjoyed reading about Ms. Rehman’s assimilation into American culture. There were many things that shocked her upon her initial arrival in New York, but that over time, became much less of an issue. She came here with the intent of only staying for the two years it would take for her husband to complete his residency, but when that time came, she’d fallen in love with America and was starting to make a place for herself and her family in this country. They moved here way back in 1971, so the climate for Muslims was much different back then. They were able to go back and forth freely to their home country to visit relatives and her relatives were able to come to New York to visit them. How times have changed! Even though they are US citizens, born and raised here, both her son and young autistic grandson are both on the “no-fly” list, simply because they have the misfortune of sharing the same names as suspected terrorists, which the author says are as ubiquitous in the Muslim world as John Smith is to Caucasians. Anyway, back when they moved here, there were no mosques in New York, so it was fascinating to see how she managed to connect with other Muslims and start building a community, not only around their shared faith, but also around some shared culture as well. And eventually, they were able to raise the funds to build a mosque, but until then, they met in smaller spaces for their own version of Sunday School. I also enjoyed how the author weaves the metaphor of threading her prayer rug throughout the narrative. There are so many things about her that changed over time, and part of what I could appreciate the most are her evolving beliefs. She came to this country with a pretty conservative mindset, which has ebbed and flowed over time. Some things which scandalized her in the beginning have become non-issues now, while she herself has become a much-more observant Muslim in her personal life. In those early years, she thought she had been a devout Muslim in Pakistan, only to discover later in life that she really hadn’t been. Wanting her children to know about both their Pakistani culture and the Muslim faith, she set out to learn more about it herself. This led her to begin observing Ramadan and eventually participating in the five daily prayers, and I have to admit that the discipline required to do these things pretty much puts me to shame in my own spiritual life. She became a leader in the Muslim community, which brought her up against some traditionalists with regards to a woman’s place and which isn’t all that different from some Christian churches I’ve attended. Later on, when she wanted a better understanding of what the Qur’an said about women’s roles, she delved into an in-depth study of their holy book, which included an attempt to learn Arabic so she could read it in its original language. Again, this puts me to shame, because that would be like me trying to learn Greek and Hebrew to read the original texts of the Holy Bible. At each step of her journey she would use the metaphor of the patterns in her prayer rug changing to indicate the ways in which she was changing. I have read a lot of books surrounding the religion of Islam. Books by those who have left the religion and are aggressive towards it, ones by those who have been converted to and those who have converted from, histories of the Middle East, I've watched documentaries about Muhammad and documentaries about ISIS and all manner of middle eastern issues. But I have never read something like this; a look from someone who is Muslim and loves her religion and at the same time abhors those who have used I have read a lot of books surrounding the religion of Islam. Books by those who have left the religion and are aggressive towards it, ones by those who have been converted to and those who have converted from, histories of the Middle East, I've watched documentaries about Muhammad and documentaries about ISIS and all manner of middle eastern issues. But I have never read something like this; a look from someone who is Muslim and loves her religion and at the same time abhors those who have used it as an excuse for terror. I wish I could meet her and sit and ask her many questions...did she work as hard to instill a love of America with her boys as she did Pakistan? Why are young men from all different backgrounds being radicalized? Is she nervous her grandsons could be? What does she think of Ayana Hirsi Ali and her cry for reform? How different would her outlook be if she had stayed in Pakistan? Has she gotten threats due to this book? To name a few. America is the greatest melting pot of the world’s cultures, races, religions and societal mores. People leave their homeland owing to oppression or for better prospects and get washed up on America’s shores. The life and career they develop out of the opportunities that await them in their new home make the later life of refugees one of affluence and plenty. The price they have to pay in return for this is the assimilation of the all-inclusive American spirit filled with tolerance and mutual re America is the greatest melting pot of the world’s cultures, races, religions and societal mores. People leave their homeland owing to oppression or for better prospects and get washed up on America’s shores. The life and career they develop out of the opportunities that await them in their new home make the later life of refugees one of affluence and plenty. The price they have to pay in return for this is the assimilation of the all-inclusive American spirit filled with tolerance and mutual respect. This has been going on for centuries until large scale migration from Islamic countries in the latter half of the twentieth century landed the US in big trouble – the infamous 9/11 incident. Muslims could not be absorbed into American society, as they always carried with them illusions of superiority over other religions, a supposed destiny to rule over the world and subjugation of other cultures under Sharia, the Islamic law. They were expected to achieve this by defeating others in a holy war called jihad. This book narrates the frequent adjustments a Muslim woman had to undertake after her transplantation to cosmopolitan US from the ultraconservative Pakistan. Utilizing all available means of communication, she reaches out to the American people to dispel such false notions that all Muslims are terrorists and in fact spreads the message that there some very good moral examples that can be discerned in Islam. 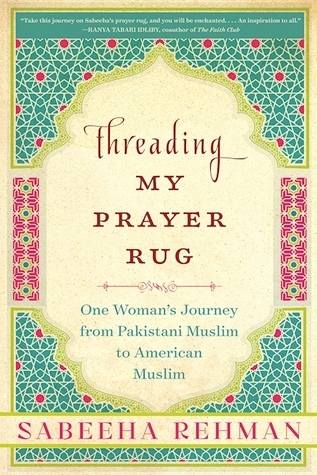 As the author says, she threads the yarn of her prayer rug to bring out the flowery beauty of an American Islam. Sabeeha Rehman arrived in the US as a young Pakistani bride in 1971. She began her career as a hospital administrator and was the director of interfaith programs at the American Society for Muslim Advancement and COO of the Cordoba Initiative. The purpose of this book is to present the religion of Islam in as favourable a light as possible in the present world of jihadi suicide bombers and terrorists who ram a truck into a crowd of innocent holidaymakers full of women and children. The religion which drives these extremists is behind the wanton cruelty perpetrated by the Islamic State, Boko Haram, Hezbollah, Hamas, Hizb ul-Mujahideen and other such agencies. Rehman carefully acclimatizes the western readers to Islam by harping on the similarities it shares with Christianity. During her pregnancy, the author’s mother asked to recite the Koran, especially the chapter on Mary, mother of Jesus and recite the chapter on Joseph for the baby to be beautiful. ‘Wow, do Mary and Joseph finds a mention in the Koran?” is the question the author wants to evoke in Western readers! Not only this, the listing of prophets in common with Christianity and Judaism such as Adam, Abraham and Moses is repeated at many places in the book. The weekly prayer gatherings – yes, of Muslim families in New York – are portrayed as jolly social gatherings resembling a picnic. How much truth is really in this is anybody’s guess. Whenever the author can’t reconcile a stubborn Islamic requirement with modernity, she seeks to rationalize it on the social conditions prevailing in Arabia in the seventh century. But, Koran is believed to be the revelation God had made to the Prophet, and how can you argue that it was applicable only to seventh century Arabia? Rehman’s selective rationalism trivializes the injunction against performing Hajj while under debt with a sweeping lifesaver by declaring that home mortgage is not debt. But no such leniency is shown in strictly following some other equally incoherent teachings like breaking the Ramadan fast at the exact instant of the sun going down in the horizon no matter what you were doing then or exempting women from fasting during their monthly periods. It is really hard to believe the author’s claim that restaurants in Pakistan remain open during Ramadan with a notice that it will serve non-Muslims only! Pakistan is an Islamic state which is continually seeking to exterminate its non-Muslim minority by conversion, exile or outright murder. It may be pertinent here to remember that the percentage of minorities in the population of that country came down from 23% to 10% in the last seventy years as a result of these measures. The tightening of religious formalism over the decades is clearly visible in the book. The author and her husband was not very religious when they first landed in the US, but soon they changed track to orthodoxy, with the author even stopping singing and refusing to apply makeup in public, while perfectly willing to don it at home for the eyes of her husband alone. Though living in the US, the author’s family never setup a Christmas tree at home and as they started to indulge in more and more Islam, there were ‘no more drives to huddle with friends, no more Sunday matinees, no more walks in the park’, but more and more prayers and Islamic Sunday schools! Isn’t this a classic example of self-imposed seclusion and auto-radicalization of the so-called moderate Muslims? Once Rehman starts her discourse on religion, nothing else is described. One wonders that if she and her family was so obsessed with Islam and to preserve its values, why then did they leave Muslim Pakistan for the US? Obscure traditions and ceremonies are re-invented among American Muslims, like Ameen, Bismillah and Isra Meeraj, which are not generally practiced in Pakistan. There, belief came on to one by osmosis from one’s peers. Denied such a group of friends and elders in the US, Muslims get such ideas from religious books which they devour eagerly to follow ‘divine’ instructions stricter and stricter. If you learnt to drive a car from a trainer, you drive it without bothering much about the technicalities. But if you had learned to drive by reading a rule book, you are so aware of the restrictions that it becomes impossible to drive. Rehman’s priorities stun the secular, but please the religious very much. She taught her two children religion, but not their mother tongue. Her family took many pains to build a mosque in New York City, but when it came to elect a governing body for it, she was most unkindly voted out by orthodoxy who didn’t want a woman a part of the decision-making. Historical errors abound in the book which claims that Muslims introduced the concept of zero in mathematics. This is simply ridiculous, as that idea originated in India and was in use centuries before the Prophet was even born! Muslim traders introduced it into Europe. Their major role was to serve as intermediaries who preserved the learning of Greece, China and India during the Dark Ages, rather than contributing any original ideas themselves. The author’s further assertion that Ibn Firnas invented a flying machine in the ninth century is pure fantasy. The author dwells at length on upgrading Islam in the twenty-first century by jettisoning some old-fashioned inconsistencies. What is targeted are customs like moon sighting to fix the date of festivals, unnecessary slaughter of lambs during Bakrid and women’s place in mosques. Have no doubts regarding this – these cosmetic changes won’t upgrade the religion in any way. What is needed is to evolve a mechanism to make Islam compatible for coexistence in a pluralistic society. The pitfall lies in believing that Islam alone is true and there are no more prophets to come. If it can be believed that God had made mankind who can do evil at any time, voices of correction, like that of a prophet, should echo out of the wilderness for as long as man is living in this world. Believing that the last word on religion was uttered 1400 years ago would only make you bigoted and the laughing stock of right thinkers. Unfortunately, this is a basic creed of Islam which is not amenable to interpretation or revision. Violence can be used to silence the critics, but when they keep mum out of fear, who is losing out in the final reckoning? The book is nicely written with a humorous and anecdotal template at the back. It gives us a glowing picture of how a wedding takes place in conservative Pakistan. The social undertones of the matchmaking and rituals are shared with that of India. A set of colour photographs add intimacy to the narrative. A group photo of the author’s all-girls class in the 1970s in which none of them had sported a hijab is a striking reminder to the hardening of religious orthodoxy over the years. The readers expected to get an honest answer to the question often posed to moderate Muslims on why they keep quiet when their religion is maligned by a terrorist act. However, the answer is clearly tangential in asserting that they are indeed speaking up. Surely, this wouldn’t satisfy an impartial observer. What a great book to follow my last one - Hillbilly Elegy by J.D. Vance, a memoir about growing up Appalachian in America. I know so little about Muslims that I thought I would not understand or like Rehman's book. The more I got into her story, the more I could not put it down. Rehman's voice is refreshing and honest. She recounts her journey as a new bride and a new immigrant in the 70's and on through her role as new mother, college student, career woman - all the while with her husband Khali What a great book to follow my last one - Hillbilly Elegy by J.D. Vance, a memoir about growing up Appalachian in America. I know so little about Muslims that I thought I would not understand or like Rehman's book. The more I got into her story, the more I could not put it down. Rehman's voice is refreshing and honest. She recounts her journey as a new bride and a new immigrant in the 70's and on through her role as new mother, college student, career woman - all the while with her husband Khalid trying to make sense of what it means to be a Muslim in America. An amazingly well written book on a journey we all go through (although not always with the same challenges). Sabeeha took us on her journey of fluctuating observance of Islam’s rituals, be it the physical ones or the spiritual ones. It is amazing how the love of her children brought her back to Islam. What is amazing, she presented her thoughts kindly that even when you disagree with her you are annoyed. In general it’s a book that makes you feel good once you are done reading it. This engaging memoir chronicles a Pakistani Muslim's adjustments to American life. Sabeeha Rehman knows her own faith well and also believes fervently in the value of interfaith connection. On a personal level, I would love to meet the author. She feels like a friend already. She was born in Pakistan. She married a stranger, in an arranged marriage, and lived happily ever after in New York. How does happily ever after happen, for a Muslim Pakistani immigrant? Read on! Arriving in the early 70s, raising young Muslim men in 9-11 New York. I am struck by how easy the hard parts are. Then, she carefully walked her way through the everyday problems of raising American children. Lovely book. She is more positive than anyone has a right to be. I loved spending a handful of n She was born in Pakistan. She married a stranger, in an arranged marriage, and lived happily ever after in New York. How does happily ever after happen, for a Muslim Pakistani immigrant? Read on! Arriving in the early 70s, raising young Muslim men in 9-11 New York. I am struck by how easy the hard parts are. Then, she carefully walked her way through the everyday problems of raising American children. Lovely book. She is more positive than anyone has a right to be. I loved spending a handful of nights reading her memoir! What a wonderful way to learn, quite painlessly & often with such good humor, about Islam and how it is lived, practiced, loved. I heartily recommend this book to everyone. "This book is the story of my life"
The above quote is from my mother, who also came from the Indian subcontinent in the early 1970s to start her new life with her husband in America. This book will have an immense appeal for that pioneering generation, as it engagingly relates their experiences of getting married, moving to a new country, and assimilating into a new culture while attempting to maintain one's prior religious and cultural identity, along with imparting the best portions of it to o "This book is the story of my life"
This book will have an immense appeal for that pioneering generation, as it engagingly relates their experiences of getting married, moving to a new country, and assimilating into a new culture while attempting to maintain one's prior religious and cultural identity, along with imparting the best portions of it to one's children. Being the child of people like Mr. and Mrs. Rehman, the book also gave me new insights into my own parents, and heightened my appreciation of the struggles they endured in order to provide us a better life. The book is also noteworthy due to Mrs. Rehman's in-depth involvement in the Park51 project, as it offers a unique and unvarnished insight into the mindset of individuals attempting to fashion a version of Islam compatible with current Western notions of progressive multiculturalism. Interesting book about being an immigrant and finding a way to create a life that blends old and new. The author's arranging of the story around events and then how she dealt with them over time made a much more interesting read. The author writes clearly, with humor and pain but it's an interesting life. What a fantastic and important book!! Sabeeha Rehman speaks honestly and movingly about being an American Muslim, wife, mother, executive, and champion of the interfaith movement. I wish everyone would read this book. What a beautiful book. This book made me laugh, cry, and perhaps most of all, feel a surge of hope. Rehman is a talented and engaging writer who conveys a lovely message of unity and dialogue. This book should be required reading! I wish I could give this book 6 stars! Really, really well written and absorbing. The narrative is jumping and it's not cohesive through out the book. But it opens my eyes to Islamic world, especially American Muslim. I truly believe this should be read by all those who fear Muslims, all those who are curious about the Islamic culture, and those who want to discern between religious fanatics and terrorists and those who are simply following a cultural belief. Sabeena Rehman writes with ease about the morality of her home life, the contrast and culture shock she experienced moving here in the early seventies, and the necessity she felt in writing this book after 9/11. Rehman has worked diligently in the field I truly believe this should be read by all those who fear Muslims, all those who are curious about the Islamic culture, and those who want to discern between religious fanatics and terrorists and those who are simply following a cultural belief. Sabeena Rehman writes with ease about the morality of her home life, the contrast and culture shock she experienced moving here in the early seventies, and the necessity she felt in writing this book after 9/11. Rehman has worked diligently in the field educating interfaith leaders and speaking with Priests, Pastors, Rabbi's and their congregations. One of the most powerful insights she uncovered, was making people confused and in their confusion, she watched them seek and learn about Islam. There are as many different forms of practicing Islam as there are ways of practicing Judaism and/or Christianity. To explore the faith is one thing, to meet individuals within each faith is to learn a lesson about humanity. I am so glad I read this book. Having been in Turkey many years ago, I found the people warm & friendly. The recent terrorist attacks were making me think they were not speaking up because maybe the ones in USA were of somewhat like feelings, just not as strong. This book answered many of my wrong feelings! I was amazed at all the interfaith things the author pursued. Her views on Pakistan surprised me, as I didn't think they were so advanced. She definitely became an intelligent and true Am I am so glad I read this book. Having been in Turkey many years ago, I found the people warm & friendly. The recent terrorist attacks were making me think they were not speaking up because maybe the ones in USA were of somewhat like feelings, just not as strong. This book answered many of my wrong feelings! I was amazed at all the interfaith things the author pursued. Her views on Pakistan surprised me, as I didn't think they were so advanced. Loved learning about the Muslim religion and cultures. I also felt very passionate about creating interfaith in our communities once I finished reading. Parts of the book were written very fluidly and well, while other parts could have used some better editing, I thought. Witty and thought provoking, elegant and educational, Rehman tells about the differences between Pakastani and American culture in reflection to her religion and identity with honesty. I liked the first part of this book the best. Very fun to learn about another culture. But their time in America never changed or didn’t capture my attention enough to keep reading. This is a great book to read! I feel like the key to peace is respect for each others religion and culture. This book teaches both. Sabeeha gives you a beautiful look into her family and faith. Get to know your neighbors! Very good way to understand Islam and what it means to be a Muslim in the U.S. I really enjoyed reading this book and learning about the author and her transformation from a young Pakistani Muslim woman to becoming an Americanized Muslim. This is a thoroughly American story of an immigrant family who settle in New York City from the 1970s until the present day. She starts as a shy newlywed and homemaker in an arranged marriage and transforms over time into an interfaith activist while watching her Muslim and Pakistani immigrant communities grow and change in their relationships with the majority population. Each step in her journey leads to another logical one as she finds her confidence and her role as a devout Muslim woman in a This is a thoroughly American story of an immigrant family who settle in New York City from the 1970s until the present day. She starts as a shy newlywed and homemaker in an arranged marriage and transforms over time into an interfaith activist while watching her Muslim and Pakistani immigrant communities grow and change in their relationships with the majority population. Each step in her journey leads to another logical one as she finds her confidence and her role as a devout Muslim woman in a changing world and an evolving personal faith - she finds two other Muslim families with whom to create a little network, then seeing no Sunday school option for her and her friends' children, she creates her own, which leads to creating a larger school, which leads to creating their own worship space, which leads to fundraising to purchase a larger space, which leads to having a role in developing the community center that was smeared as the "mosque at Ground Zero." Over and over again, Rehman highlights the importance of building and creating the kind of community you want to see. Even though things didn't always work out the way she wanted (when she ran for a board position within the Mosque she was resoundingly defeated), she kept working at it. The only reason I took one star away is because the writing style is a little cheesy (she continues the prayer rug metaphor throughout the book), which distracted from the overall inspiring story.